In a cubic centimeter of aged water inhabited by fish, there may be more than 10 million suspended bacteria, many of which cause disease in fish. Despite the alarming statistic above, as long as fish have no wounds, parasites, little or no stress, good nutrition and water quality, the bacteria will cause no harm. 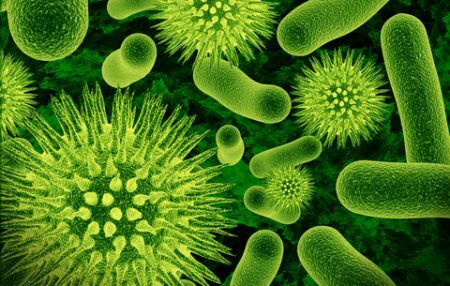 All the usual suspects can cause a sudden population explosion of bacteria. An accumulation of mulm or detritus, a dirty or clogged filter, an unnoticed dead fish, uneaten food, water that hasn’t been changed in a while, these all allow bacteria to flourish. The bacteria aren’t the problem, the water quality is. With any of the above conditions prevailing in the water your Goldfish are living in, the water quality will be poor. Poor water quality as we know stresses fish, and stressed fish get sick. 1. Septicemia. After gaining access to a fish’s internal organs, bacteria can disable a vital organ such as the kidney. The fish may die suddenly, or it may swell up and display dropsy like symptoms (bacterial attack of the kidney is one cause of dropsy). The danger of septicemia is it can go un-diagnosed as a bacterial infection, leaving other fish in the same community at risk. 2. Ulceration. Ulcers can appear on the skin or fins as an open sore which can have a pink/red to white center surrounded by a blood red or white edge. If left untreated they can cause an electrolyte imbalance due to salts leaching out of the fish, septicemia or spread to internal organs, all of which will kill the fish. 3. Toxic shock. Certain Aeromonas bacteria can produce toxins that circulate through the fish’s bloodstream. This causes hemorrhaging, liquefaction of internal organs and ultimately death. This is similar to septicemia in that it can go un- diagnosed as a bacterial infection because there are no external symptoms. 4. Bacterial gill disease. Bacteria infect the gills causing large areas of tissue to die. The gill tissue looks blotchy with white areas. This damage kills the fish, usually within 72 hours of the first symptoms of infection. Bacterial infections can be expected in any fish that has suffered stress from not only water quality but starvation, winter temperatures, chilling, overheating, overcrowding, parasites, breeding trauma or poor handling. Listed below are the more common bacterial diseases that can be easily identified by careful observation of your fish. Fin rot. The fins begin to look milky or cloudy, and then the tips whiten and rot off. Longer finned varieties seem to be more susceptible to fin rot and it is often first noticed in the caudal fin. If left untreated the caudal fin will rot off completely and the caudal peduncle will become infected. Mouth rot. Mouth rot is often caused by a parasite attack so this cause needs to be eliminated before treating for a bacterial infection. Mouth rot occurs when fish rub their noses against the sides of the aquarium or ornaments causing the mouth to become reddish. The lips soon start to separate from the fish and strands of tissue detach. If treatment isn’t started immediately the condition is noticed, the mouth may collapse in on itself leaving a jagged hole. Body sores. These can start as a red patch of scales, and if left untreated will become red sores where the scales peel off revealing a hole with exposed muscle and flesh. It takes weeks for the sores to heal once treatment is started. Pop eye. The fish’s eye (or eyes) protrudes from the socket. In severe cases the eye can appear to be completely popped out on what appears to be a fleshy bag of water. It is caused by a bacterial or tuberculosis infection behind the eye. Bacterial gill disease. The two most common causes of bacterial gill disease are low dissolved oxygen levels and overcrowding. If a fish starts to behave abnormally, check its gills. Look for discoloration, white patches, or decomposing areas in the gill arches. If your water quality is good, then you can assume any gill damage has been caused by bacteria not environmental conditions. You can also assume that parasites were the initial problem allowing bacteria to invade areas of the gills damaged by the infestation. Bacteria generally aren't a threat to Goldfish, even in very high concentrations. But being an opportunistic organism, they will attack fish when their immune systems are weak. And always be suspicious of any sudden deaths. It's now 9 weeks since starting the second Splosht test, and I still haven't got a clear pond. The water characteristics have changed from a milky green color to a clearer milky brown, so the algae seems to have been dealt with, but the water is far from clear. The pH is good so my fish are in no danger. I have eliminated the possible failure factors of water temperature and an overly optimistic time frame of 4 weeks from green to clean from the makers. I have two fish in 300 liters with two high volume sponge filters so the pond isn't biologically stressed. I still have one treatment sachet left so I will use that and then abandon Splosht as a green water treatment option. To all my valued readers, have a very happy and prosperous 2018 and see you in the new year.